there is a wide range in the inventory from over 60 high end dealers. On Thursday evening I attended the opening night celebration which was abuzz with collectors, designers and aficionados alike. The diversity of design made for a fun and lively visit, with something for every taste and price point. Here are a few finds that caught my eye. 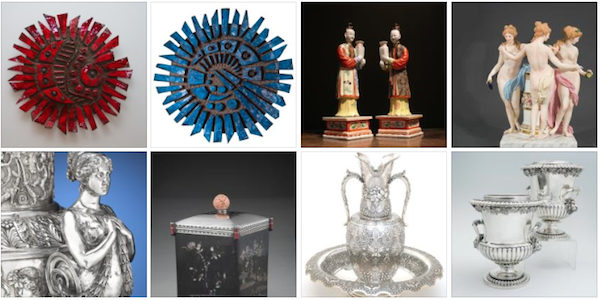 Linda Willauer Antiques from Nantucket has a wonderful selection of antiques including this fabulous collection of Chinese export porcelain. 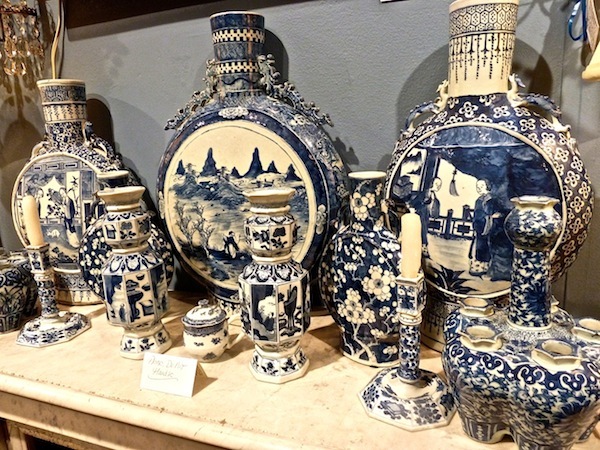 The fantastic Underglaze Blue Moon Flasks in back are from circa 1860. 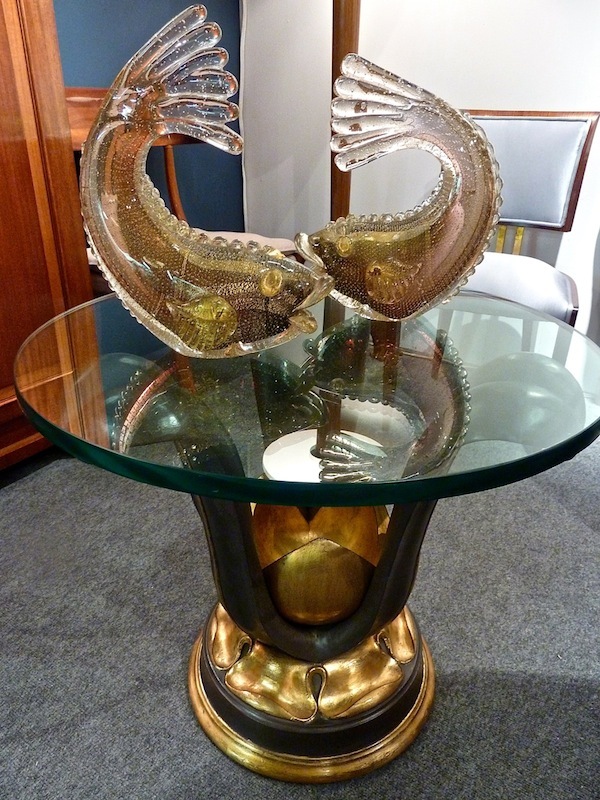 Another dealer in classic antiques is Michael Pashby, whose pieces I have featured before. 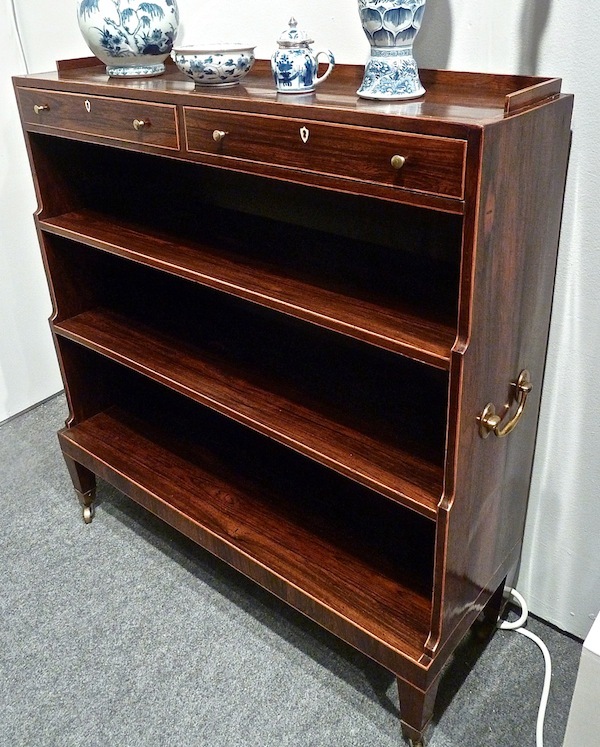 This fine Regency Rosewood and Inlay Waterfall Bookcase dates from c. 1815. At 36″ wide and a mere 12-1/2″ deep, it is an incredibly handsome and useful piece for almost anywhere in the house or apartment. M.S. 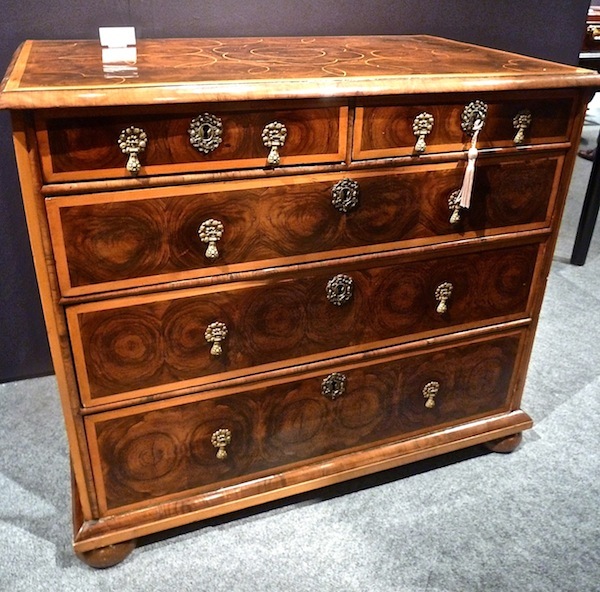 Rau Antiques from New Orleans had an eclectic assortment of rare furniture, art and jewels including this Tiffany 200 piece flatware service for 12 from circa 1920, above, and this handsome English William and Mary Oyster Chest from c. 1690. 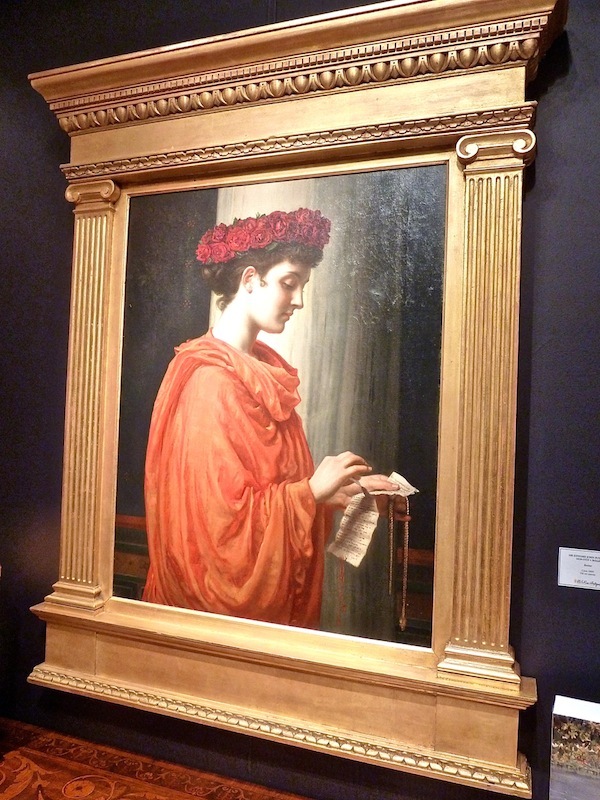 They also featured this recently discovered painting, “Barine” (of Horace’s Odes) from 1894 by British academic artist Sir Edward John Poytner, who was once President of the Royal Academy. 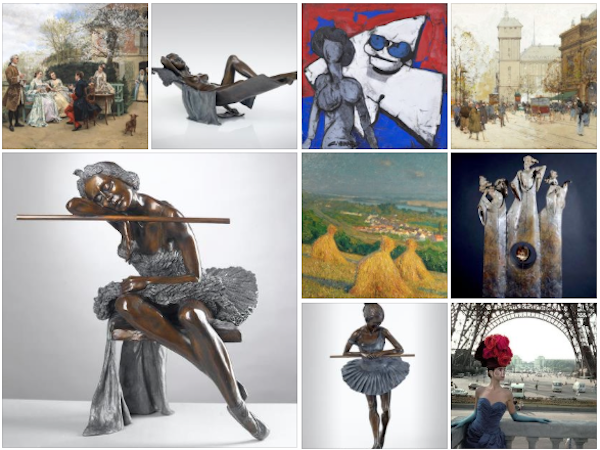 Martin du Louvre is a Parisian dealer who specializes in 20th century sculpture, paintings, drawings and photographs. It was impossible not to stop before this stunning statue (one of a set) by Libero Andreotti. 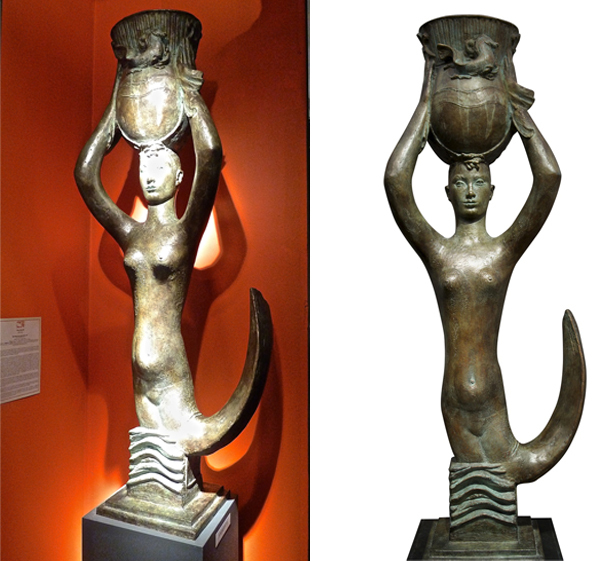 “Due Sirene (Two Mermaids),” from 1951, is a lost wax bronze cast of impressive proportion. Over eight feet tall including the base, it is striking in its simple yet elegant lines, evocative of something patrician and yet pagan – a strong and haunting piece. I have included a shot from the dealer as well since mine did not capture its essence. 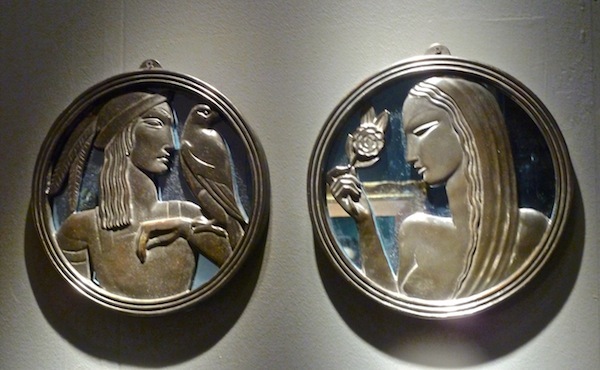 Also from Martin du Louvre were Atala and Chactas, patinated bronze and blue mercury mirrors by Boris Lovet-Lorski from 1925, so beautiful in their graphic yet sculptural form. Milord Antiques from Montreal featured this lovely vignette with one of a pair of carved wood gilt and painted round side tables with glass tops from c. 1940 by Canadian artist Louis Pistono. On top sits a pair of splendid clear and amethyst Murano glass fish by Barovier with gold speckled inclusions (the set includes a matching bowl). I’ll bring you more finds tomorrow, but wanted to remind you of the show in case anyone wanted to visit over the weekend. Sunday at 1pm is also a special presentation on collecting art by Miller Gaffney, President of Miller Gaffney Art Advisory followed by a full day of great programming on Monday curated and arranged by the New York School of Interior Design. This entry posted in art, design, fashion, furniture, gifts, interior design. Entry Tags: Linda Willauer Antiques, M.S. Rau Antiques, Martin Du Louvre, Michael Pashby Antiques, Miller Gaffney, Milord Antiques, New York School of Interior Design, NYC antique shows Bookmark the permalink. ← It’s Fall – A Busy Week! Whenever I see that you have a new post, I feel like a kid in a candy store….I run right over as I know you will always have something that I want or need to see or learn about. 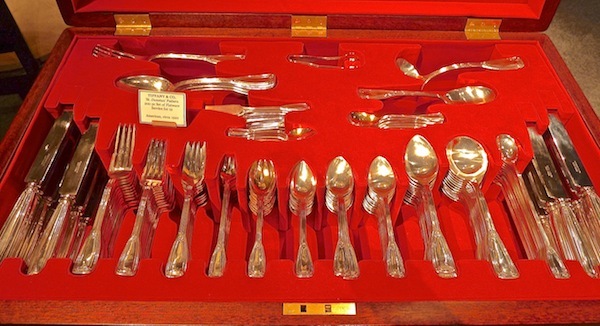 I hope to take my husband as part of his anniversary gift….we love antiquing, always have. I’m echoing “pve”–and this post is no exception. I love the jewelry. Must haves for today (I neeeeeed them now): the elephant and the duck–these pieces are so happy and original. Of course, being an antiques dealer, I love keeping up-to-date with what is current. Those deco bronze mirrors are gorgeous. Have a great Sunday. Looks like a wonderful show and I love M.S. Rau Antiques I just can’t afford them. They have an amazing shop in New Orleans and on 1st Dibs. An enticing selection. 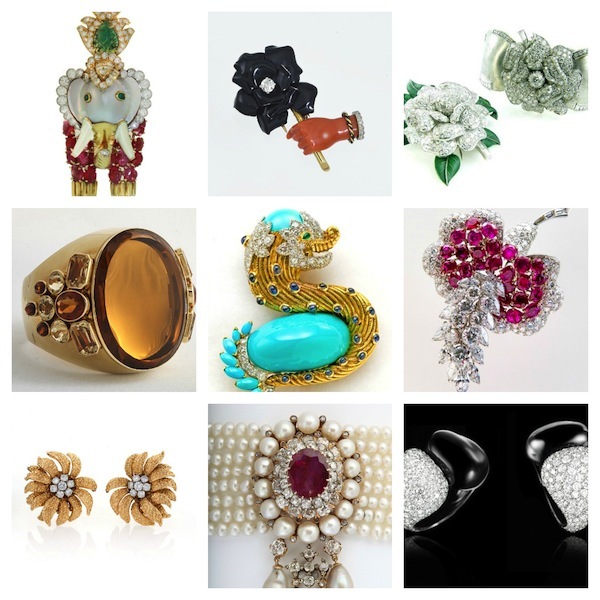 I’m swooning over the jewels, especially the elephant and turquoise serpent. Very special. Heading to the antique Marché in Nice tomorrow, will write about it soon. Such amazing art and antiques!! Thank heavens I have you to give me the tour!!! I really enjoyed reading these posts on the Show. Having been away, I unfortunately missed it. I will be exhibiting at the Greenwich Design Show in early November (I will send you an invite) and your images were great inspirations as I am working on the design, furniture pieces and color story for the 15 x 15 booth. 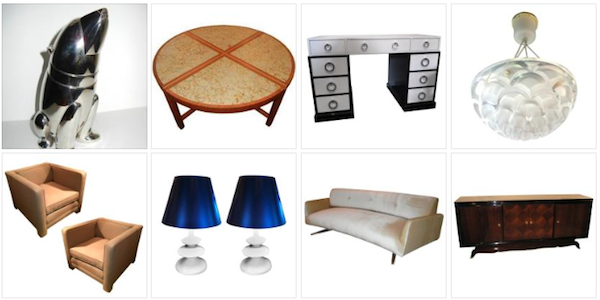 Wonder post and collection of photos.. I’m especially swooning over the oyster chest and jewels… and who doesn’t love Mid-century furniture? 78 queries in 0.482 seconds.